PHM organizes People’s Health Assemblies to bring together activists from across to globe to share stories, build strategies, and plan for action toward achieving health for all. These assemblies began with the first People’s Health Assembly (PHA) in Bangladesh and have grown to be organized at regional and country levels. 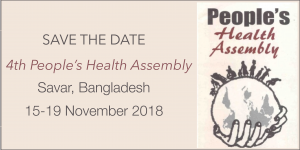 On November 15-19, 2018 health activists from across the globe will gather in Savar, Bangladesh for the 4th People’s Health Assembly (PHA4). For more information on the assembly and how to attend click here and check back often for updates!